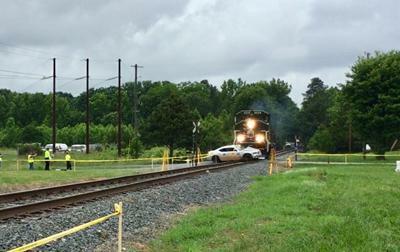 (Star) – The N.C. Department of Transportation has a safety message for motorists: Never try to outrun a train at a railroad crossing. To illustrate its point, the agency today staged and videotaped a simulation showing a remote-controlled car trying to beat a train at a railroad crossing in Montgomery County. The car, fitted with crash dummies, did not get over the crossing before the train smashed into it. Wednesday’s simulation better illustrates some sobering lessons about why motorists should never try to outrun a train. People may not realize, for instance, it takes a train traveling at 55 mph more than a mile to stop and trains always have the right-of-way, even when emergency vehicles are involved. The only safe, and legal, place to cross railroad tracks is at a public crossing designated with either a rail crossing sign, flashing red lights or a gate. All railroad tracks are private property and trespassers can be arrested or fined, according to North Carolina General Statute. Do not cross the tracks immediately after a train passes. There might be a second train approaching. Stop and look in both directions. The train you see is closer and moving faster than it seems. Never walk or ride a bike on or near the railroad tracks. Tracks are not a shortcut. It takes a train traveling at 55 mph more than a mile to stop - that's more than 18 football fields. Always expect a train at every highway-rail intersection. Never drive around lowered gates. It's illegal and deadly. Trains always have the right-of-way, even over police, fire and ambulance vehicles. Never stop a car on the railroad tracks. If you stop to wait for a train at a traffic signal, always stop safely behind the white line. NCDOT hopes Wednesday’s simulation – the first of its kind in North Carolina – will educate motorists and reduce the number of fatal collisions at railroad crossings. To help with analyzing data from the crash, officials installed in the car additional onboard crash sensors that produced data which the Institute for Transportation Research and Education and the NCDOT can use to evaluate and improve safety. The simulation was conducted by NCDOT’s BeRailSafe program in partnership with North Carolina Operation Lifesaver, and the Aberdeen Carolina and Western Railway to educate motorists about respect for railroad crossings while reminding them about one rule: See Tracks? Think Train!